Infrastructure has grown as part of pension funds’ and insurers’ portfolios. BlackRock estimates that as of 2015, global asset owners’ endowments were on average targeting a 6.1% allocation in infrastructure, but had only a 4.1% exposure[i]. But investing in real assets may not be an option for many pension funds and insurers due to their complexity and illiquidity. 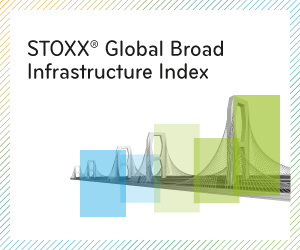 For investor seeking global, well-diversified and liquid exposure to the asset class, the STOXX® Global Broad Infrastructure Index is an option at hand. The index is made up of 151 public companies from developed and emerging nations and takes a broad definition that includes all sectors that are vital to the development of the economy. The STOXX Infrastructure Index serves as the underlying for the FlexShares STOXX Global Broad Infrastructure Fund, which trades in New York. For a low-vol and high-div version of the index, STOXX also developed the STOXX® Global Infrastructure Select 30 Index, which is by design reinforcing the stability and income profile of the asset class. For more information, please view the material below and contact us here. [i] 5 “The New Prominence Of Private Assets,” BlackRock, June 2016.